Kemod Shoal is near to Monad Shoal and it’s another seamount with the top part at around 14 to 16 meters and a drop off the reaches more than 200 metres depth. 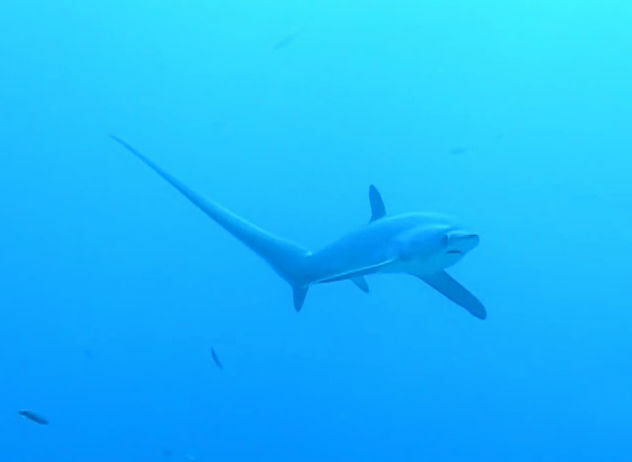 Even here it’s possible to see thresher sharks, mantas and devil rays, but the main attraction of this dive spot is a school of hammerhead sharks the can regularly be seen between December and May, and occasionally through the rest of the year. The top of the island has a lot of hard coral and many excellent hiding spots for moray eels and frogfishes. The sides are covered in soft coral growth. Many species of shrimps can be found among the corals and several species of usual nudibranchs. The east side is especially interesting for its rock formations and overhangs.